And the winner of our book giveaway last week . . . is Sarah of Victoriously Free! Congratulations, Sarah! Just e-mail us your address and we'll send you the book. "Sick of being single?" The ad glared at me as I logged into my e-mail account. Apparently Comcast wants me to realize that the answers to all my happiest dreams lies within their online dating site. Honestly, though, I'm not sick of being single (I'm only eighteen, after all!) so much as I am sick of hearing about it. In our culture today, if you're single, there is probably something the matter with you, at least that's what we're told. And even in Christian circles, there seems to be this growing obsession with finding the perfect formula to make God realize that it's time to bring that guy into our lives. You know what I mean--the "as soon as I'm content I'll meet Mr. Right" mantra, and all the accompanying actions and prayers designed to convince God that we're really content and therefore He should get going. And the "singleness is a gift!" phrase is really worn out by now. That tired phrase is true, though. Singleness is a gift. But most people try to convince us that singleness is a gift because it's the only time when we'll be able to do so many things--travel fancy-free to Africa to do missions work, or start a ministry, or something worthwhile we wouldn't be able to do when we are married or in a relationship. That may be true--but honestly, God doesn't value us for our work; he doesn't even primarily care about our work. He cares about our heart. 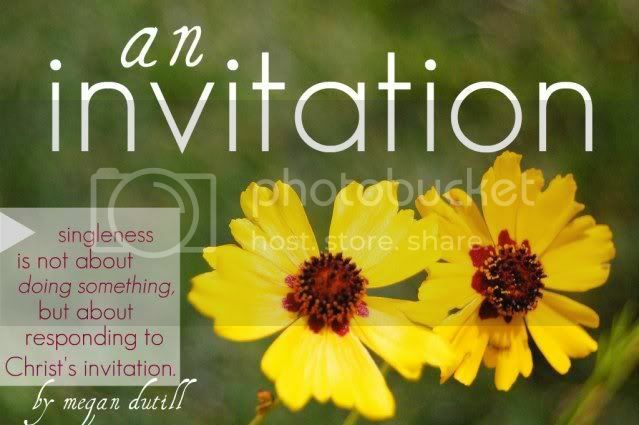 And this season of singleness is really an invitation. It is an invitation to draw near to God, to enter into unity with the Creator, to learn more about him and learn to love him. "An unmarried woman is concerned about the Lord's affairs," Paul writes in I Corinthians 7:34. "Her aim is to be devoted to the Lord in both body and spirit." The language of being concerned and devoted may be a bit dry, but can we truly say that we are wrapped up in God's work right now? That we want to know what he's doing and be a part of it? That we cling to him? I can't say that, right now. But I'm learning. And I'm realizing again that I've been given this time to be undistracted and turn the gaze of my heart to Christ. I love these words about single women from Elisabeth Elliot: "She keeps her heart as the Bride of Christ in a very special sense, and offers to the Heavenly Bridegroom alone all that she is and has. When she gives herself willingly to Him in love, she has no need to justify herself to the world or to Christians who plague her with questions and suggestions. In a way not open to the married woman her daily 'living sacrifice' is a powerful and humble witness, radiating love. I believe she may enter into the 'mystery' [of Christ and the Church] more deeply than the rest of us." We celebrated Easter yesterday. We remember his love that is stronger than death, remember how he rescued, ransomed, and redeemed us. He took our debt upon himself and fought to set us free. Christ desires us to draw near to him and know him. And as Elliot writes, Christ invites us into the special mystery of Christ and the Church. Will we answer his invitation? Thanks for posting-that passage in 1 Corinthians (is it?) really had me stumped for a while, so the post really helped :). I agree. Sometimes are culter makes me want to puke. It is good to know that someone has... is intersted in the samequestions as me. Well, except the mariage part. I am not old enough yet. Thanks for helping me out! I once was driving somewhere when I saw a big billboard which said,'' still a virgin, need help?'' That made me sick to the bottom of my stomache. It is very sad how our culture is seeing viginity as a thing to look down upon.